Most scientists want science to serve as a source of knowledge and progress. However, we cannot forget that it has been used, and is still used today, in the servive of war, thus becoming an indirect accessory to war crimes (violations of the International Humanitarian Law, as laid down in the Geneva conventions and additionnal treaties). Scientists are not directly responsible for this misuse of science, but can they avoid feeling implicated ? The year 2005, International Year of Physics in celebration of fundamental achievements of Albert Einstein in 1905, is also the 60th anniversary of the two atomic bombings, reproved by Einstein and other scientists, of civilian populations of Hiroshima and Nagasaki, and the 50th anniversary of the Russell-Einstein Manifesto for disarmament. This day for sharing information and reflecting together on these problems should not of course be seen as opposition to legitimate work destined to ensure a nation's independence and its defence against foreign aggression. 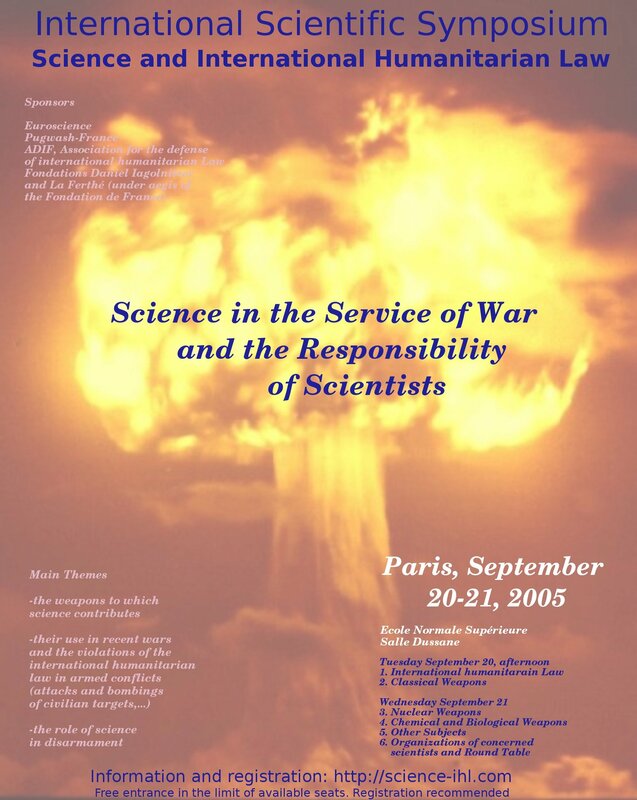 The Symposium will recall some outstanding “feats” of science in the service of war in recent history and related current affairs, such as the atomic bombs in 1945, with in 2005 projects of “new nuclear weapons” on the one hand and new requests, under the impulse of the Mayor of Hiroshima, for the abolition of nuclear weapons on the other hand, or also the massive use of a chemical weapon (agent orange, containing dioxine) in Indochina during 10 years with its consequences, still present today, on the environment and population (illnesses, infant malformations,...) and the requests in 2005 for new scientific studies and compensation of victims. It will present the recent developments of sophisticated classical weapons (airplanes, missiles, bombs,...), their use in recent wars with for instance more than 100 000 civilians killed in Irak according to an October 2004 report in "The Lancet", and new projects (militarization of space,...). The question of torture assisted by physicians and scientists will also be raised. General agenda of the Symposium : plenary talks will present, in a precise and synthetic way, the historical and technical aspects of the different weapons, their use and prospects, the pertinent elements of the International Humanitarian Law and its violations, the possible contributions of science to the implementation of international treaties on disarmament and to the control of the international arms trade. They will be followed by a Round Table where representatives of various groups of concerned scientists will present their views and activities, and where the present situation and perspectives, as well as the attitudes and responsibility of scientists and their Institutions, will be widely discussed.